We have the flowers, we have the foliage... now all we need is the sun. 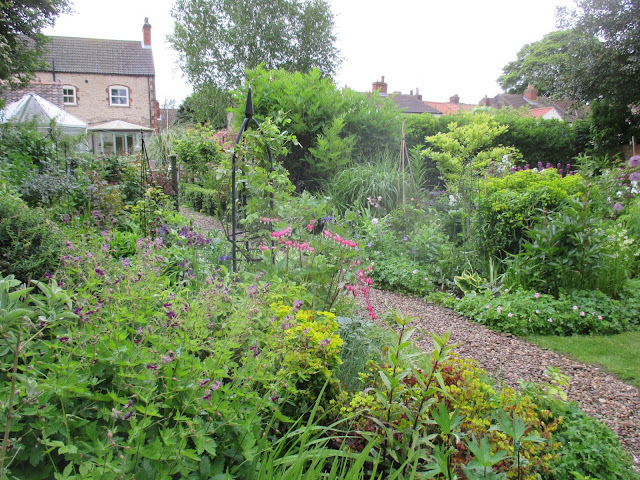 May has been a cold month here in deepest Lincolnshire, and has also been a bit grey and miserable, for the most part. Despite this, the plants have been blithely growing apace, especially the weeds which are definitely appearing overnight. Everything seems about two weeks later than last year I think, for example, my first rose bloomed mid May in 2014 whereas this year, the first one began to flower only a couple of days ago. 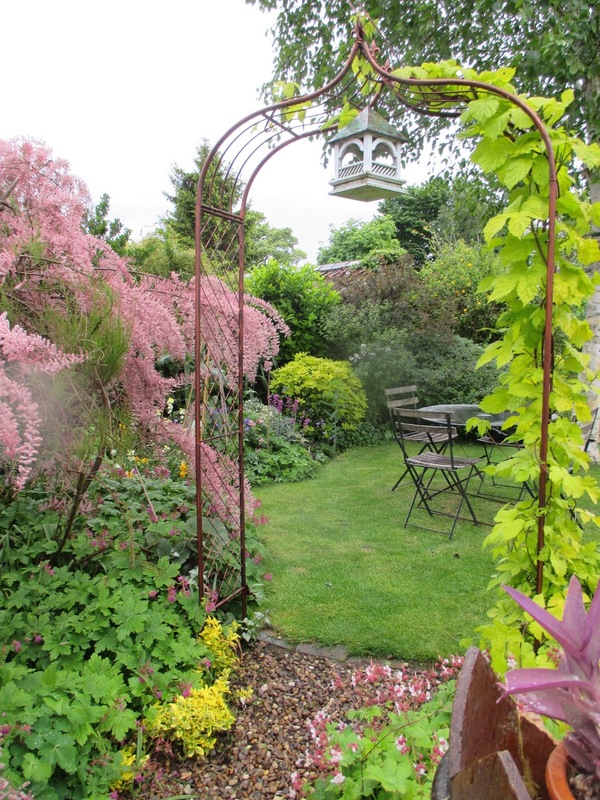 We are running round the garden like headless chickens at the moment, as it is our NGS (Yellow Book) Open Day on Sunday, 21st June . Not very far away now. Terrifying. 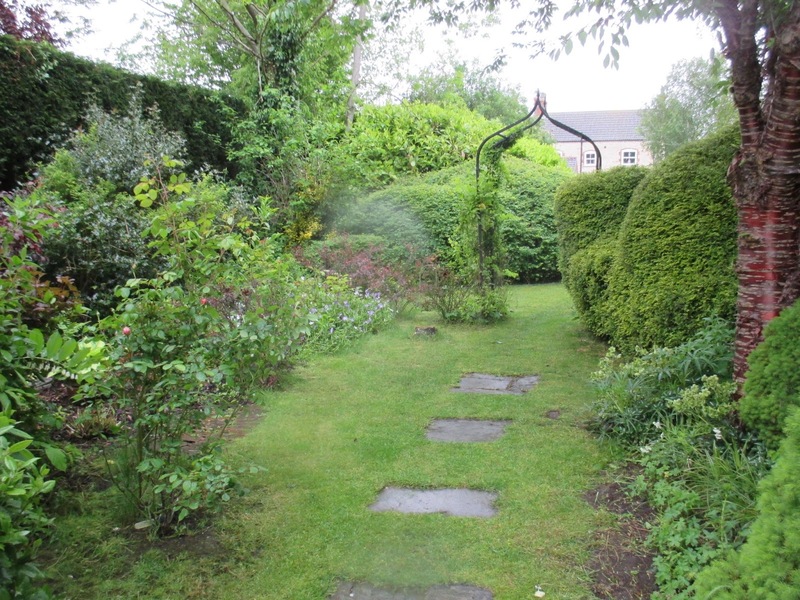 I am having bad dreams where I open the gates to let people in, only to realise that we have forgotten to get the garden ready, and the lawn is knee high and the borders are overrun with weeds. 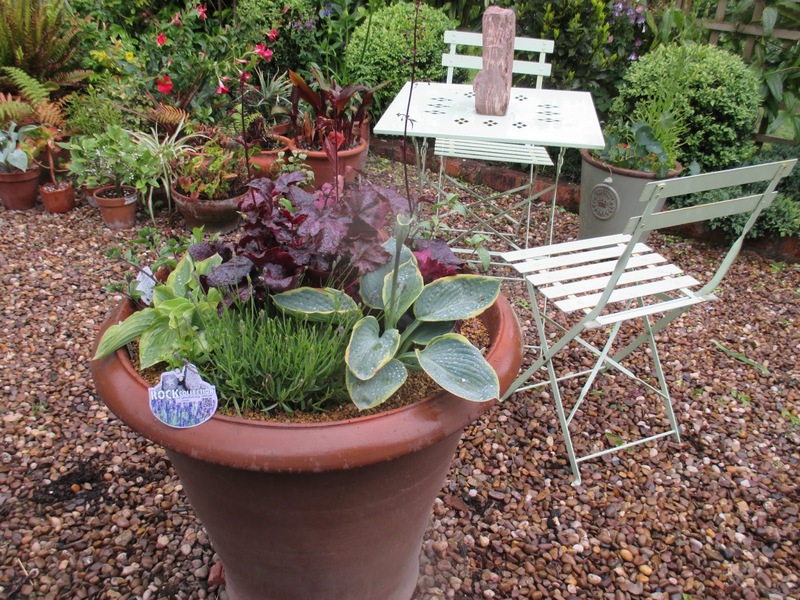 We have just bought this new terracotta pot and planted it up, but needless to say it is half full of polystyrene and a large upturned plant pot, to reduce the amount of compost needed. It has a heuchera ('Purple Palace'), two hostas, a lavender ('Hidcote') and a trailing fuchsia in. The pots are all planted up now with a mix of dark purple petunias, geraniums, lobelia and purple nemesia, but I am disappointed with the nasturtiums i grew from seed. They are 'Empress of India' and I was expecting a subtle red, but they look as if they will be a bright brick red/ orange which is NOT what I wanted at all! The hostas are so far unblemished by slugs and snails and I have to hang my head in shame and admit to using a few slug pellets. We were going to trial garlic wash this year, as we went to a talk about it at Tatton Park last year, given by a hosta grower, but we hadn't the confidence to give it a go ... maybe next year! The tomatoes are in their final positions now, 'Romello' outside in the veg patch, and here in the greenhouse 'Sweet Aperitif', 'Sungold' and that reliable old favourite 'Gardener's Delight'. 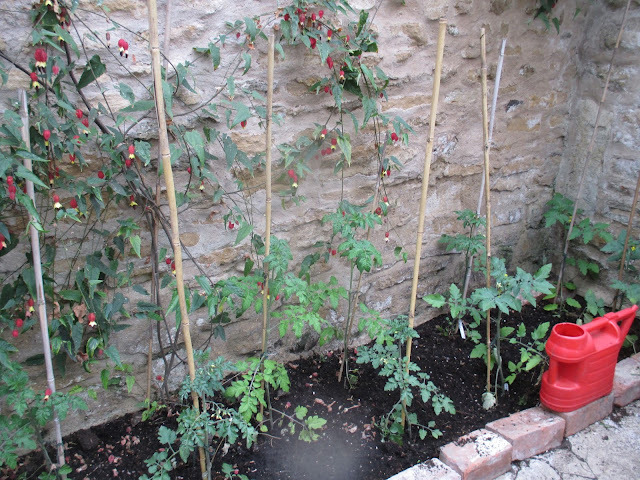 Behind the toms is Abutilon Megapotamicum which scarcely stops flowering, even in winter. 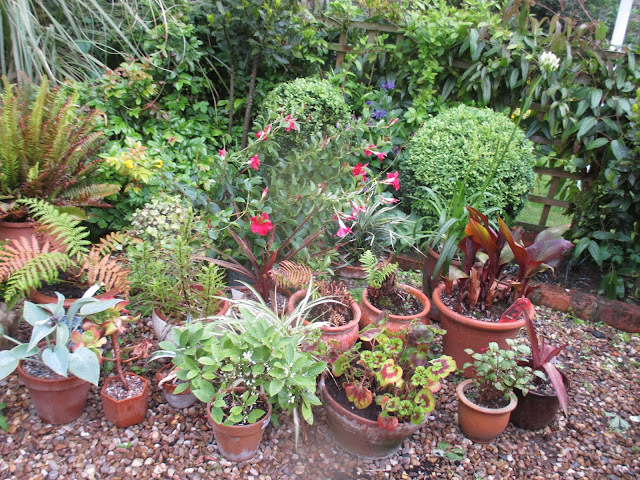 Not in the photo, but there is also a grapevine, 'Black Hamburg', which has its feet in the cold outside, and its head inside, in the warm. It seems to be enjoying this arrangement and is putting on terrific growth. All the Erysimums are fantastic this year, and they would be right up there at the top of my list of favourite plants. Even the bees adore them. I have 'Bowles Mauve' of course, and also 'Gogh's Gold', 'Caribbean Island' , 'Winter Orchid' and 'Monet's Moment'. I have grown Sweet Rocket for the first time from seed, but am cross with myself as it has grown taller than I expected so it is nearly all planted in the wrong place, and is too near the front of the borders. 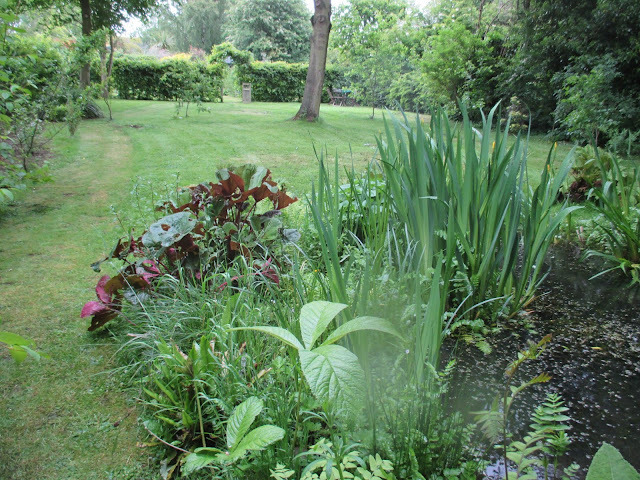 Below is the 'Top pond', home to lots of newts and baby newts at the moment. 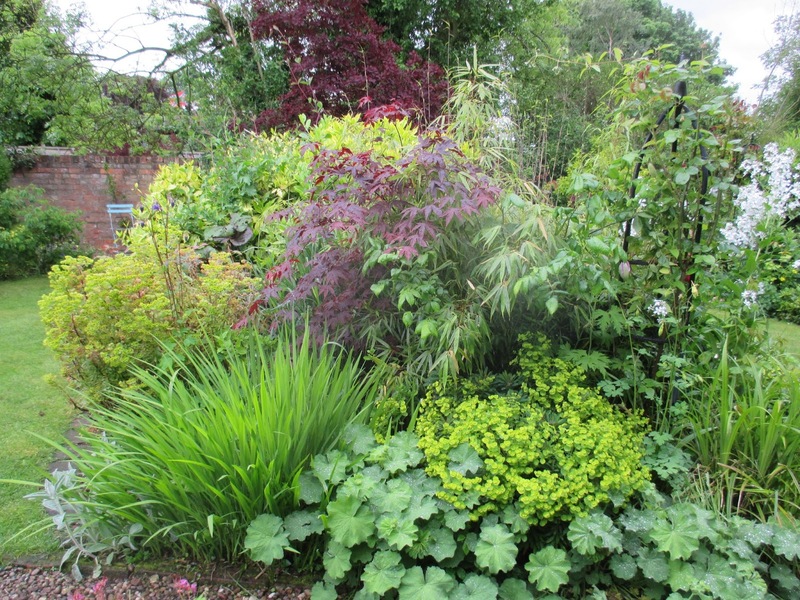 This bed has a core of bamboo, an acer Palmatum, various Euphorbias, crocosmia, alchemilla mollis and a climbing rose. Apologies for the rain spots on the camera lens, as it was absolutely hammering down when I took these shots! 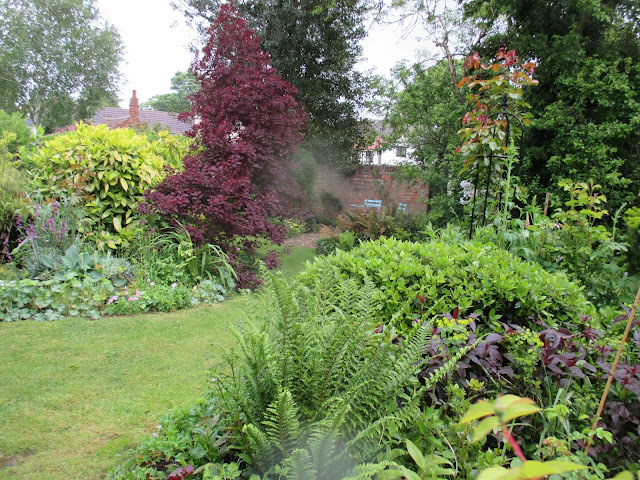 The background red is Cotinus Coggygria 'Royal Purple', and the yellowish shrub is an Aucuba. 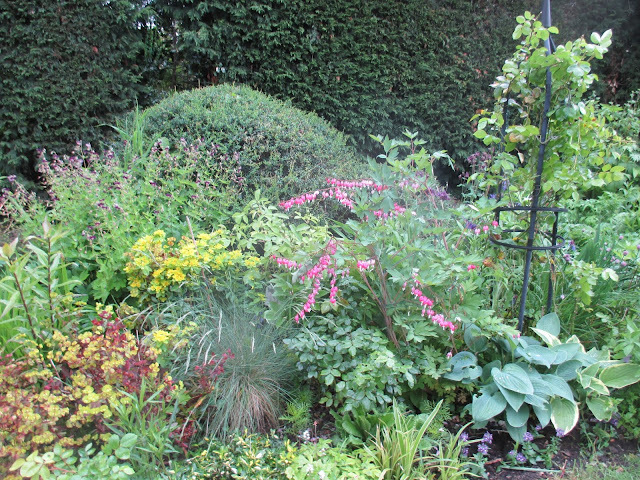 The dark red in the foreground is Lysimachia 'Firecracker'. 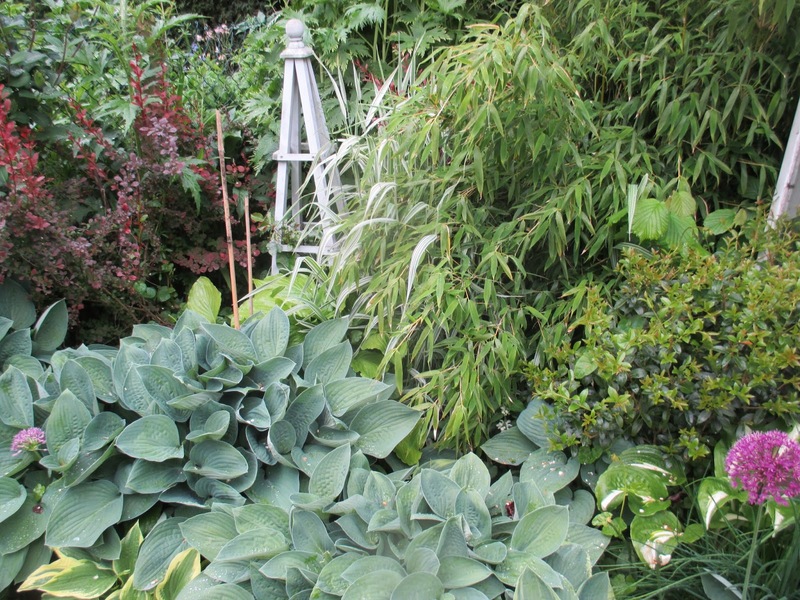 Colour is provided by Euphorbias and the dicentra, while the Fistuca Glauca grass and the hosta give the grey, glaucous foliage. Berberis Darwinii (at the back) has been tamed into a neat little dumpling, but is a beast left to its own devices! In the foreground is Prunus Serrula, with a sculpted Lonicera hedge behind. Young Berberis Thunbergii Atropurpurea are supposed to be forming a low curved hedge, growing up to the arch, but they are taking an age to reach a decent height and density. Due to the imminent collapse of the old 'Bus shelter' we have had to invest in a new one, which doesn't need painting, and looks as though it could be used as a boat if we have a flash flood ! 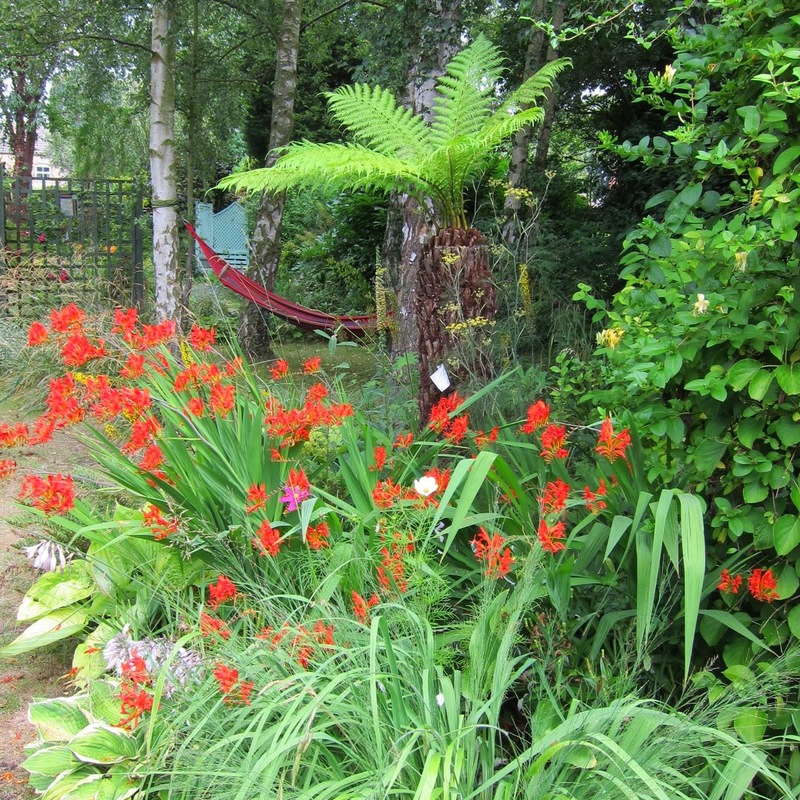 The sub tropical garden is growing as we watch, and most of the ferns have unfurled now. 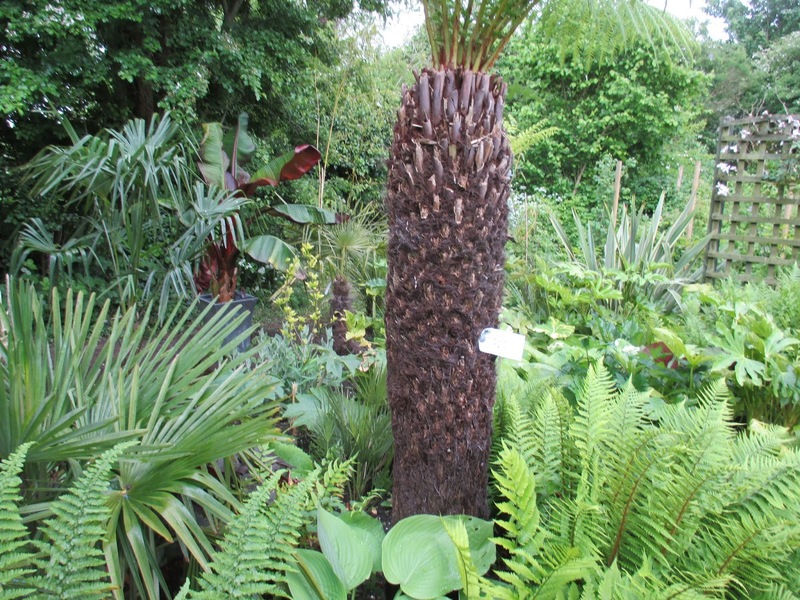 The Tree Ferns are nearly fully out too, and they all survived the winter, thank goodness. 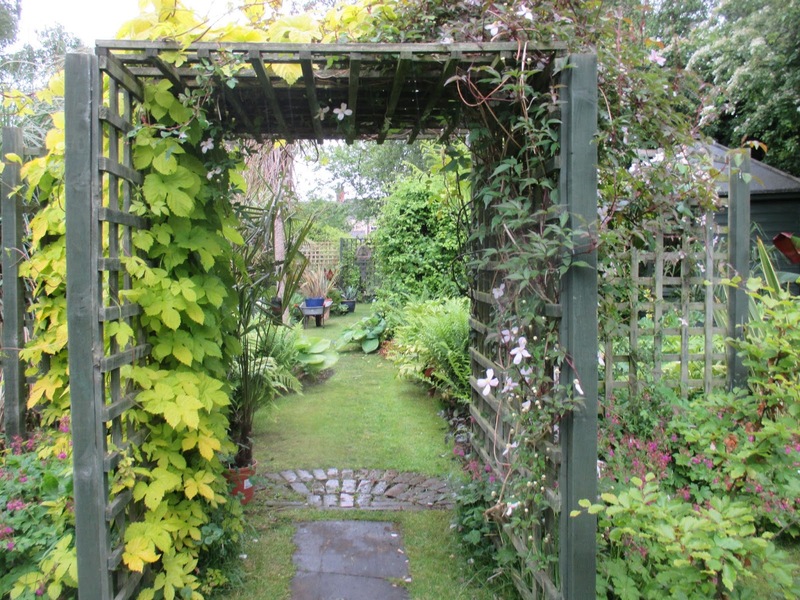 This arch has two competing thugs which vie for supremacy - Golden Hop and Clematis Montana. Both fantastic plants but both are extremely vigorous and fast growing. The veg plot now has strawberry plants in flower, french beans, new potatoes, sweetcorn, courgettes, pumpkins, squashes, courgettes, onions and 'Romello' outdoor tomatoes. 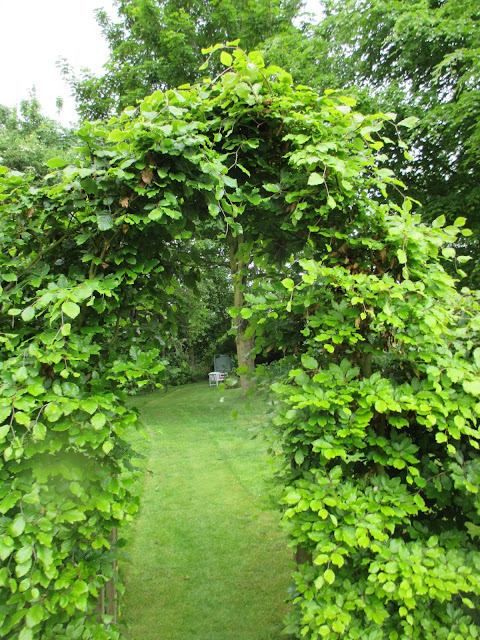 The green beech arch is now thickening up, and needs a bit of attention, as new growth needs to be tied in. 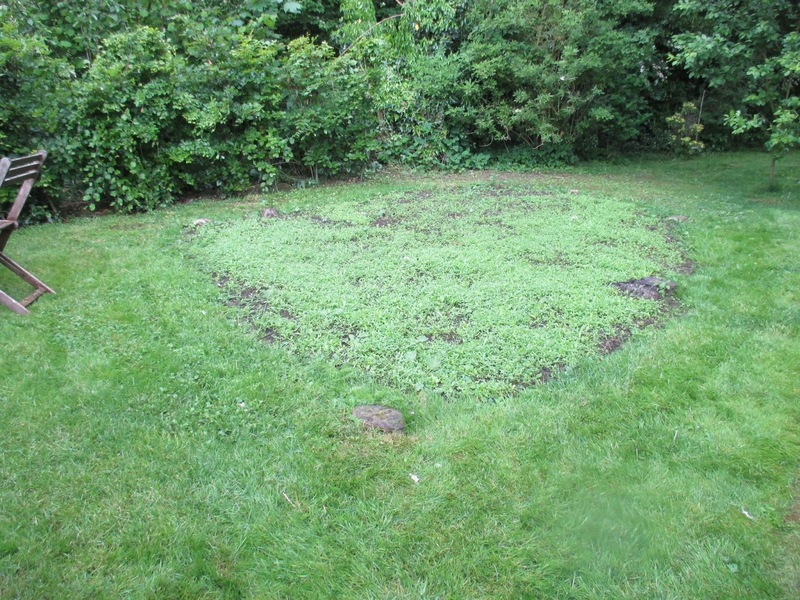 It may look like a patch of weeds, but it is , in fact, a patch of wildflowers! I fear we have planted it too late for it to be in bloom when we open the garden, but it will come into its own later in the season, I hope. 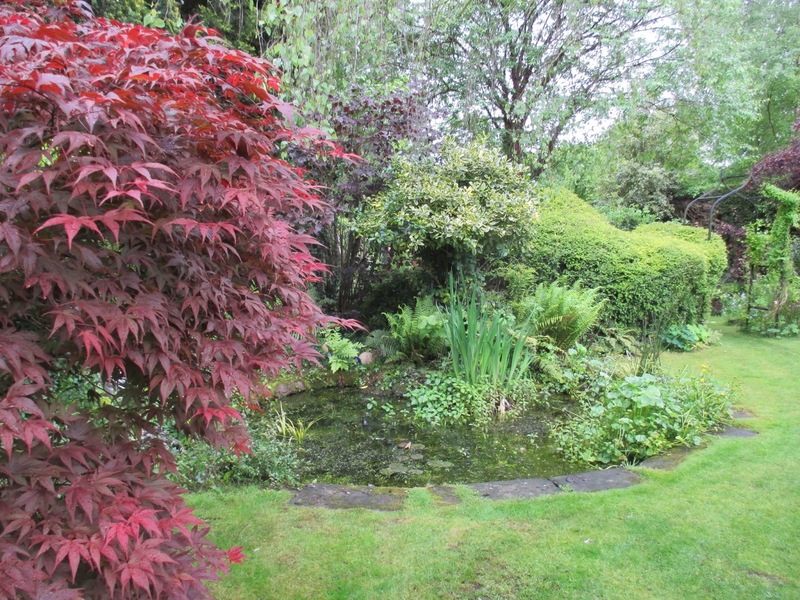 The pond is the clearest it has ever been at the moment, because of the rain I think! It is alive with thousands of tadpoles, but the sticklebacks seem to have just about disappeared over winter for some reason. I catch the odd one in my net, but they are not in evidence anything like as much as they usually are. Something must have killed them off I think. So, that's it! 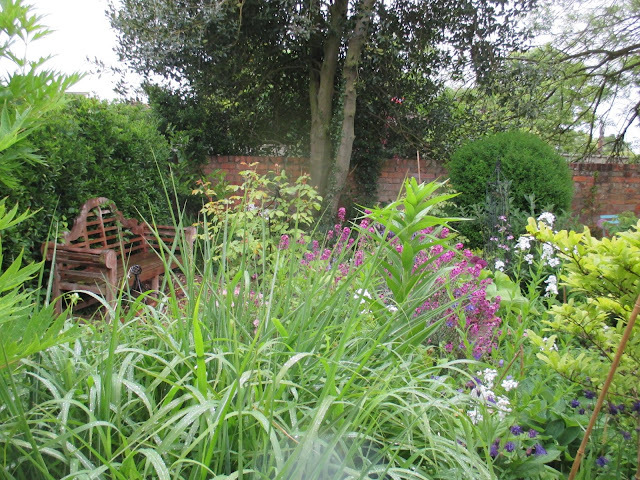 As May tips over into June the garden is at my favourite point of the whole year. I wish I could freeze it like this, before everything grows too big and starts to sprawl and go over. If I had a magic wand to wave this is the moment I would choose, when everything is new and fresh and so full of promise. It looks great! Good luck on your tour. We have been getting lots of rain too. Very unusual for this time of year. Hi Philip, thanks for comments. We have had ridiculously high winds over the last few days ... its JUNE for goodness sake!! A lovely tour, what a day we had yesterday, you are a hardy soul going out in it to take photos. The garden looks so beautiful, I wish I lived a bit nearer so that I could come to your open day. I have had the sort of dream you are talking about, not being prepared for something and sometimes you have no clothes on either. I hope you get a lovely sunny day and lots of visitors. I know they will love it, they are in for a treat. Hi Chloris, you are too kind! I have had the 'no clothes' dream too ! Must be a common anxiety dream!! I have fingers crossed for sun, but after the near gales of the past few hours I am lowering my sights a bit ! have you experienced the same winds ? Hope your garden escaped damage ! I have the wading through treacle dream, where I desperately need to get somewhere but everything conspires to stop me. 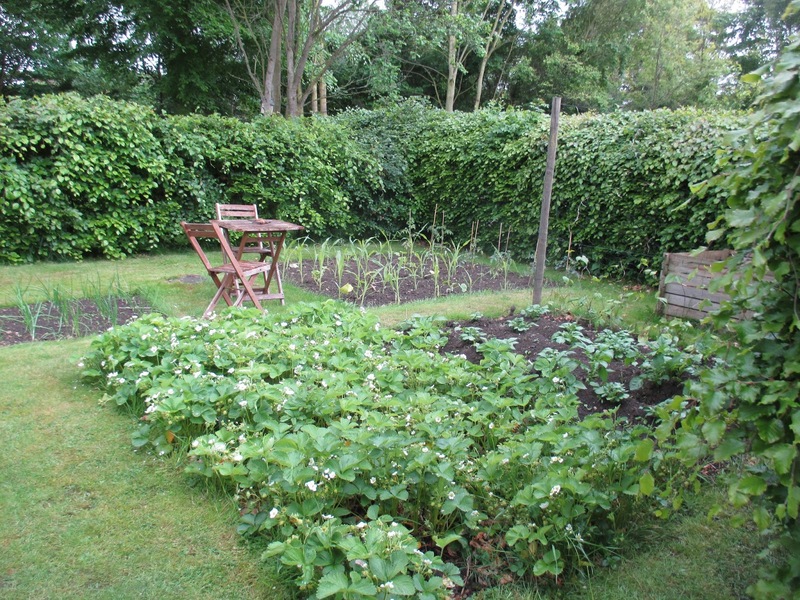 It looks like you're about ready though, the garden is looking fabulous. Hope it goes well. Hi Jessica, and thank you for your comments. I also have the 'treacle' dream and one where I am teaching and have forgotten to prepare anything for the lesson, which, needless to say, all goes pear-shaped. I guess people in different jobs have specific job-based scary dreams. Be an interesting Phd study for someone!! Hi Nicole and thanks for your kind comments. June is just the best time in the garden by far! You certainly seem to be ready for your visitors, the garden looks fabulous! I love all the contrasting texture that you have, it really sets off the flowers. All you need now is better weather! Hi Pauline , thanks for your comments. better weather would be fantastic for us all. Is the weather behaving for you this season ? Your garden is lovely and I am sure that your open day will be a great success. Thanks Sue, we are currently debating how many cakes to bake !! If it rains we will have to eat them all ourselves !! 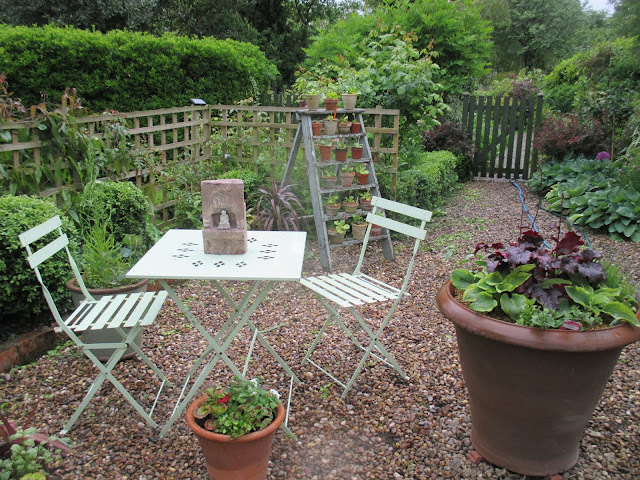 The garden is looking good and ready for opening now, I hope you have good luck with the weather. We can now relax. I have tried the garlic wash, along with organic slug pellets, on hostas for two years now with mixed results, nothing seems to stop them eating the Patriot Hosta. Hi Brian, 'mixed results' sounds interesting! Some success then, I trust? The host grower who gave the initial talk we attended said he had 100% success and that was all they used. Guess it must depend on which varieties you grow. Some seem to appeal less to slugs and snails anyway. Hi Helen and thank you for your comments. The old step ladders were only £5 from an architectural salvage yard which opened (very briefly) in our village. It is ideal for displaying Auriculas except that my clumsy, overfed fantails keep crash landing on it and knocking the pots off !! 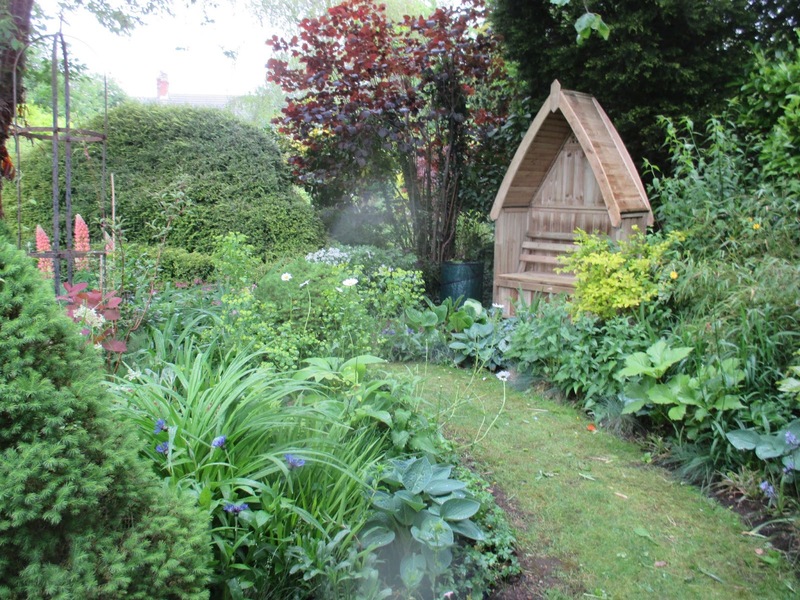 I think you should stop worrying as your garden looks fantastic. What a treat to see all the photos you took. I too wish I could see the real thing. Have a great open day. Hi Normala and thank you for your comments. I always look forward to your posts.....your gardens are so beautiful and you have a great sense of humor! When you open the gate of your garden to the public all you will hear are Ohh's and Ahhh's! So beautiful.....Will you explain more about the garlic for slugs? We have our share of them and I'm falling more in love with Hostas all the time! I'm glad your garden isn't frozen...I can't wait to see the wild flower bed..... Happy Gardening! The garlic wash is made from boiling bulbs of garlic in water , straining it and using the resulting liquid (diluted) as a wash for hostas. 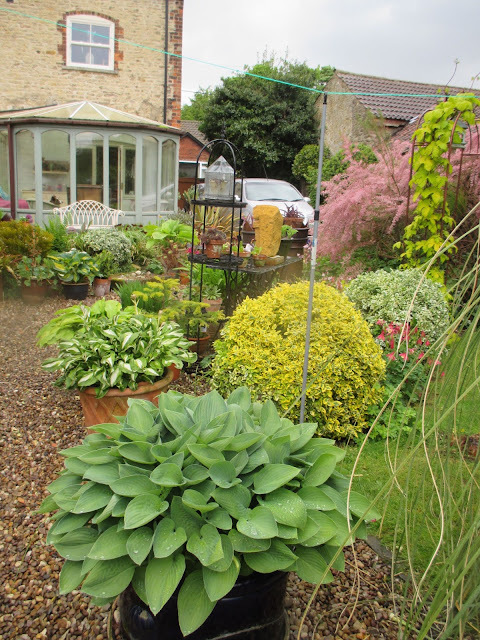 The hosta grower giving the talk said that it is the only thing they use to keep slugs and snails at bay, and it really works . I haven't tried it yet, but will do next season. what is that lovely tree with wine dark sea bark banded with silver? Hi Diana, the tree is Prunus Serrula, a gorgeous thing with the most wonderful shiny bark which hangs down in translucent streamers. what a lovely garden! I hope your open day goes well (and why wouldn't it?). Thank you ! I enjoyed my visit to your blog btw ! Hi Rick, Lysimachia Firecracker ran riot for me too and I spend my life pulling out rogue stems which pop up everywhere. Far too invasive for my liking ! Thanks for kind reassurances about the garden ! Oh I have a similar dream about taking my 'A' level English Literature exam in which it's a week to go and I've only read one of the eight set texts! 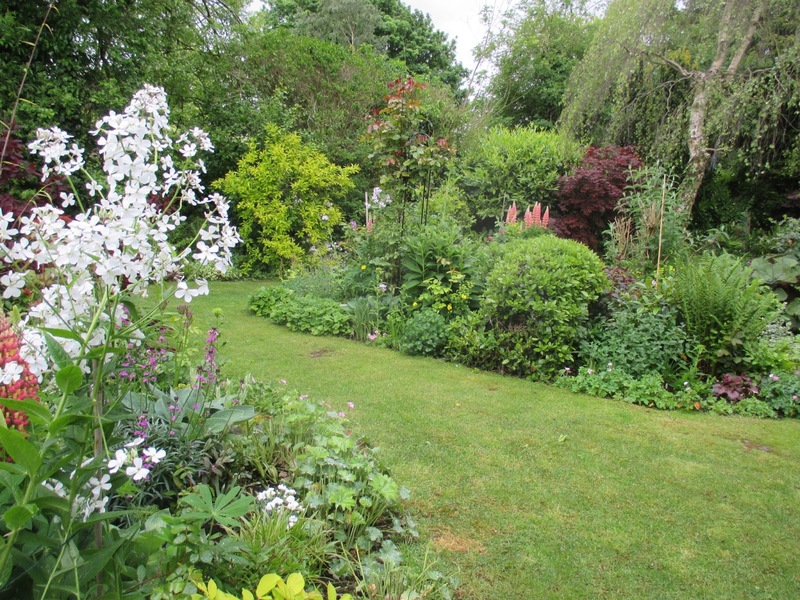 All turned out well in real life.Your garden is looking fabulous Jane and I would be there like a shot for the open day if it was nearer. Will keep my fingers crossed that the sun shines on the day. Hi Anna, I have that one too, only I have just not done any of the coursework! None ! Then I can't find out the essay titles !! I wish you could come on Sunday, that would be lovely !! Hope you caught fine weather, and lots of happy visitors! Hi Diana, we were very lucky with the weather as this summer is proving to be a typical English summer ! Mostly rain, chill and grey! We had a nice breezy sunny one ! We had lots of visitors and raised lots of money for charities, thanks!